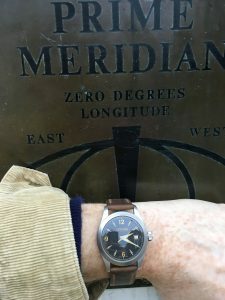 Just before Christmas I had the pleasure of using a Dennison watch for a week or so. I first came across the company at their launch at the Salon QP in 2015 and I had been keen to try the watches ever since. The revived brand has a great story. 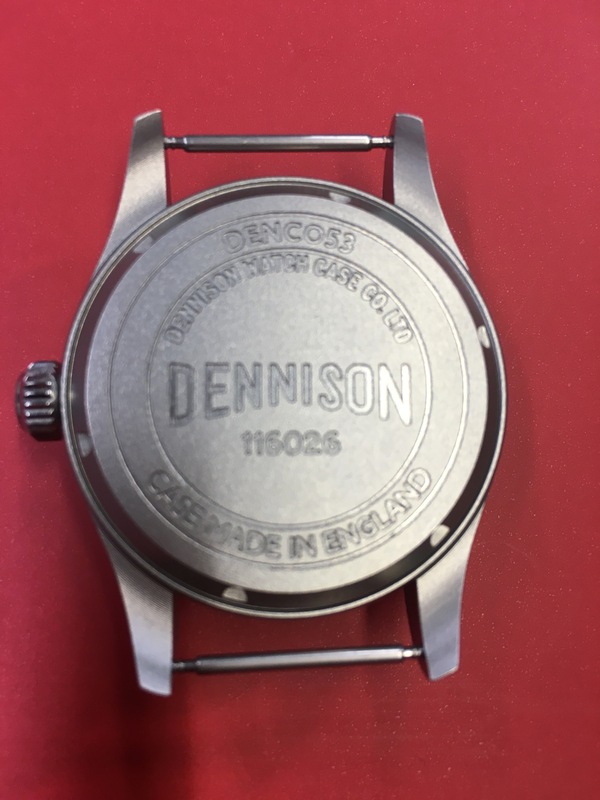 The Dennison Watch Case Co. Ltd was established in 1905 by Franklin Dennison and his son Major Gilbert Dennison, after acquiring the shares of Alfred Wigley. 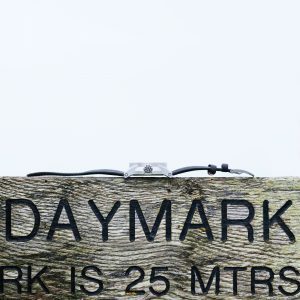 Over the following 60 years, the company grew to become the largest watch company in England and known around the world for its fine Dennison Quality (DQ). Dennison designed and manufactured watch cases for world famous explorers specifically for expeditions – in 1913 for Sir Ernest Shackleton’s Expedition to Antartica on the ship ‘Endurance’, and in 1953 for Sir Edmund Hillary and his team’s successful Everest Expedition (image adjacent showing an advert from 1954 published in the HJ). During the same year, Lieut. Commander Lithgow broke the World Air Speed Record flying over Tripoli, reaching a speed of 735.7mph (1184km/h), whilst wearing a Dennison Aquatite cased watch. 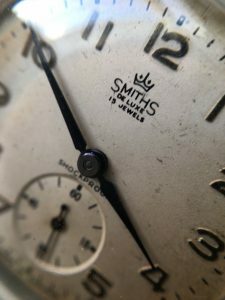 Over the years, Dennison became most renowned for their close working relationship with watchmakers and retailers such as Rolex, Tudor, Omega, Longines, IWC, Jaeger-LeCoultre, Zenith, Smiths, J.W.Benson & Garrard. Dennison supplied them with the highest-quality watch cases designed to house the finest-quality movements. I picked up the watch from Toby Sutton the founder of Dennison complete with the all the packaging one would get if you bought the watch. This all looks identical to that shown at the launch. Inside the leather watch case there is an additional strap and a very useful spring bar tool. The first impression of the watch is how “natural” it feels on the wrist. The 38mm case is a very easy size to wear, slipping easily under a shirt cuff, should you need it to. Although the “black dial DENCO53” on this natural brown strap might not be your first choice for office wear. 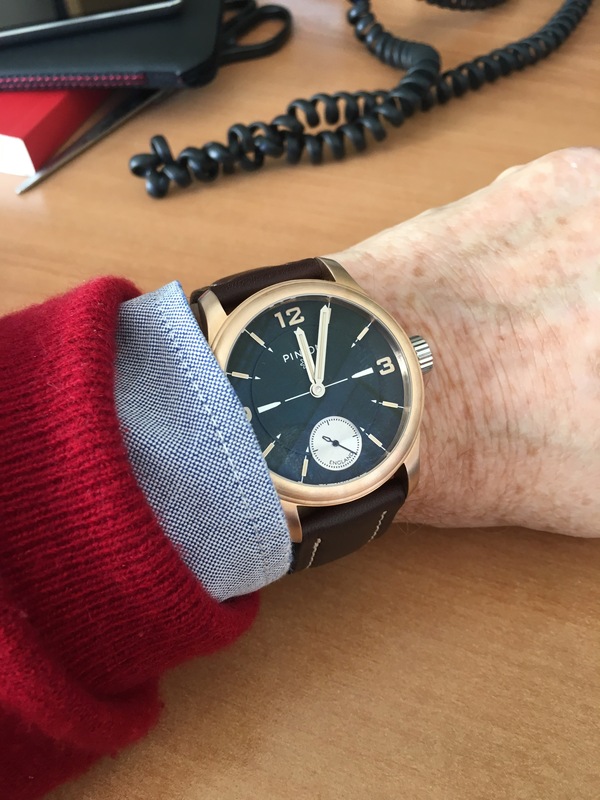 I did also question the dial description with Toby, to me the “black” dial is really a rather dark green he calls it “matt black – honeycomb”. The overall design of the watch has a very pleasing traditional/retro look. The shape of the hands being quiet distinctive when compared to similarly styled watches, that tend to be more aviator in design with straight hands. The two elements that are really nice are firstly the copper-ish colour of the numerals and the the logo and the use of plexiglass which gives a different warmth to the more usual crystal. The only areas of the overall design that I thought could be re-looked at was the distinction between the bevel and the rest of the brushed steel case. Then purely from a nationalistic point of view “England” under the Dennison logo could be a little larger. The caseback is solid, which I personally prefer as it is a great position for further interesting detailing. In the case of this watch you will see (below) you will see the number 116026 showing this watch was number 26 of the first batch of 2016. Living with this watch is very easy, it feels indestructible especially given the 100m water resistance rating. 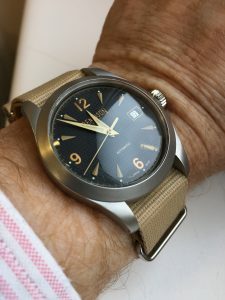 This “wear and forget” feeling was further underlined when I switched the leather strap for a nylon NATO so avoiding any potential sweat/leather issues. When changing the straps I fully realised the benefit of the drilled through lugs, making the change a breeze. I tried several colours, I think this sand colour being the best, it matches very nicely the lume on the hands. So on one of the last shopping days before Christmas with some regret I dropped the watch back with Toby. 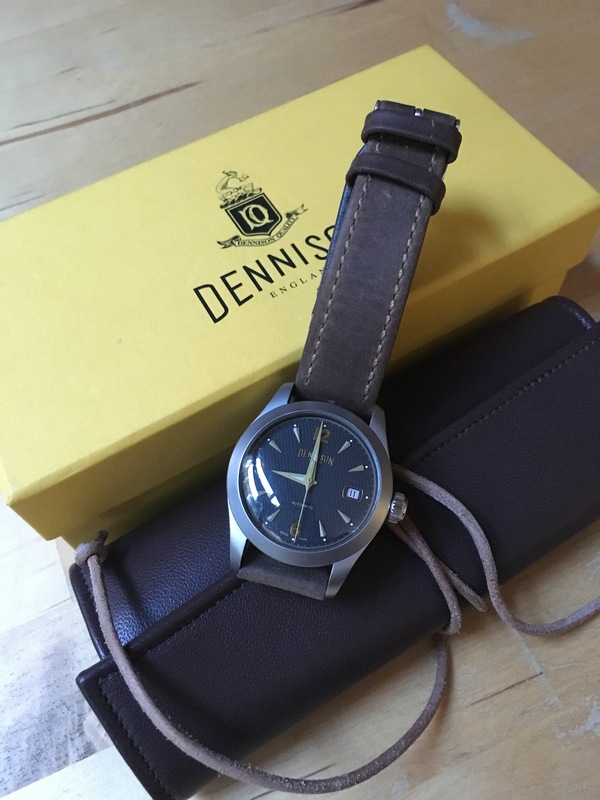 I think Dennison have fully fulfilled their brief of producing a robust field watch – the sort of watch you never really have to take off. 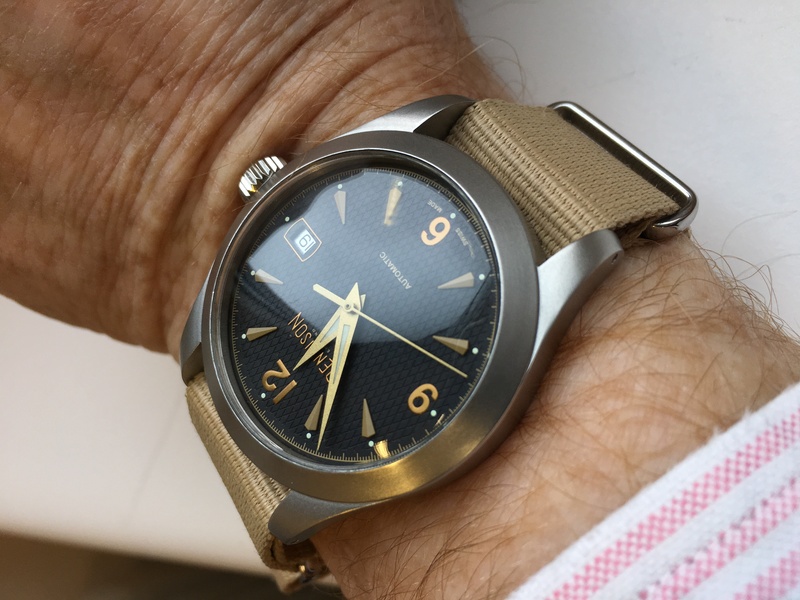 You might have noticed on instagram that I now have my own Pinion, An Axis Pure with a dark green dial, The green dial previously on the Gunmetal Green version of this watch. My first impression when compared to my previous English watch, the Smiths Deluxe, was big and heavy. But clearly that is compared to a 1950’s 35mm steel watch. You might remember that I have been suggesting for some time that cases over 40mm were getting a little large for my taste. Maybe I should re-consider this as my other regular wear is a Speedmaster Pro which is also 42mm. With it’s 42mm case and wide (22 mm) strap the Pure is actually re-assuringly solid. The manual wound Unitas movement reinforces that sense of dependability. The last feature making this the perfect weekend/holiday (and maybe Friday) watch for me is the 100m water resistance rating. Finally, there is the bronze case. Pinion now feel this material is becoming too mainstream. 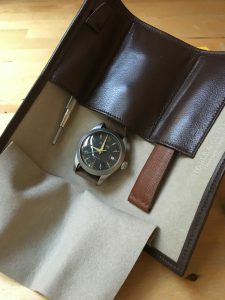 Coming from the generation that appreciated how materials such as denim and leather become more personal with age I am very happy to have a watch that will do the same. I will keep you updated on how the patina develops. 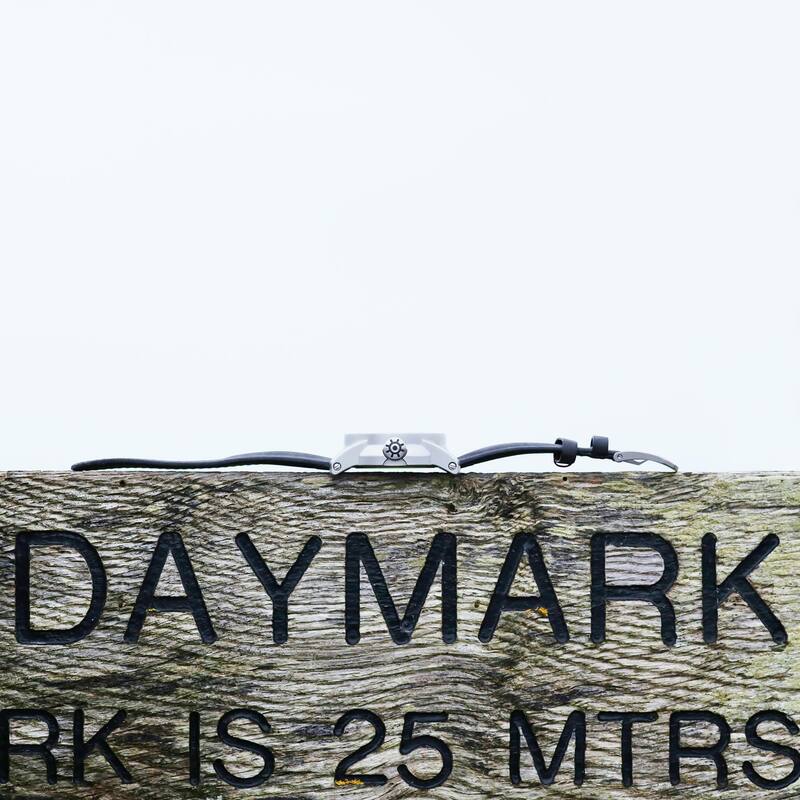 Well we now know it will called the Daymark. Schofield have slowly releasing images such as the one above to wet our appetites. As the post suggests I will keep an eye open for more details. If you missed seeing the new Fears watch at this years Salon QP here is a video that shows it off nicely. In my opinion better watched without the commentary. Just in case you didn’t notice my Smiths Deluxe is up for sale. The auction ends tomorrow (Friday December 9th). To create space in my collection I have decided to sell my “Made in England” Smiths Deluxe.